The Logitech H820e Wireless Dual Headset is designed for wireless communication over a wide coverage area. This headset and microphone combination features a dual earpad design and a noise cancelling microphone. The Logitech H820e features a charging stand that automatically pairs with the headset when docked. The headset can be used up to 100' from the charging stand and provides up to 10 hours of wireless talk-time. The microphone boom features a mute button with an LED indicator for easy access. There's also an LED indicator on the rear of the microphone to alert those around you that you're on a phone call. 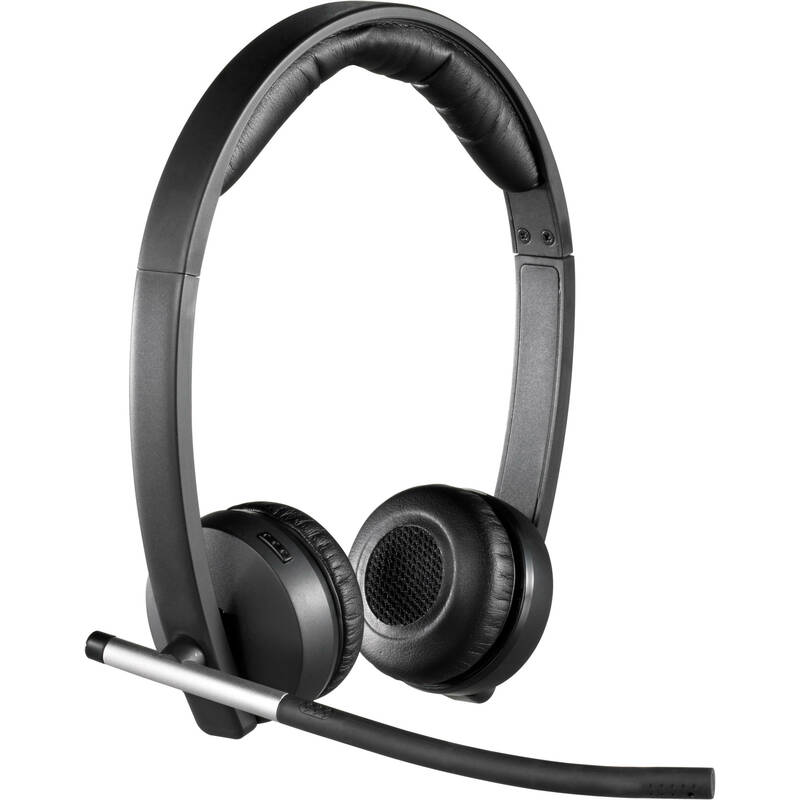 The Logitech H820e has an adjustable microphone boom and headset for added comfort. This headset and microphone combination is plug-and-play, which means no software is required when connecting it to a Mac or PC. A USB cable is included for connecting the charging stand to a computer. For added productivity, the Logitech H820e is also compatible with enterprise applications like Cisco and Microsoft Lync. With a weight of 4.5 oz, this headset was designed with portability in mind. The Logitech H820e features DECT technology, which is designed to provide exceptional wireless range that won't interfere with other Wi-Fi devices. H820e headsets automatically pair when placed in any H820e charging stand, making it easy to use the headsets with any workstation in a large office setting. The mute button is located on the microphone boom for easy access. An LED light that can be seen while wearing the headset provides a visual mute status by glowing red while muted. The Logitech H820e is optimized so you can hear and be heard even in noisy workspaces. Provides the option to switch to narrow band for improved performance in areas of high density deployment and for extended talk time. Wide band offers an extended coverage area. Located on the backside of the microphone boom, this provides visual alert to those behind you that you are on a call, preventing accidental disturbances during calls. Control the call with on-ear answer/end and volume up/down buttons. The raised button design provides a point of reference for your fingers so you can feel the buttons you're pressing. Enables precise tuning for both the microphone and speaker so conversations are more life-like. The headset is built with high quality materials and designed to remain comfortable over extended periods of use. The Logitech H820e is compatible with UC platforms like Microsoft Lync, Skype, Cisco IP Communicator, and Google Hangouts Pro. Box Dimensions (LxWxH) 9.2 x 7.1 x 3.1"